(Video) This Easy Fish Trip is Mind Boggling. Get a Tasty Meal While Bugging Out! In just about every survival situation, there is one constant in terms of feeding yourself, virtually wherever you are located. This is that just about everywhere on the planet, fish are available for catching and consumption. Even in urban areas, ponds in parks and other waterways hold at least carp and usually several other varieties of fish. The trick is knowing how to catch them and while everyone would prefer a fishing kit with an adequate reel, rod and lures, in some cases, that is just not possible. Luckily, you can build a fish trap, quickly and easily as long as you have access to the materials and a relatively flat place in the water to build and set your trap. 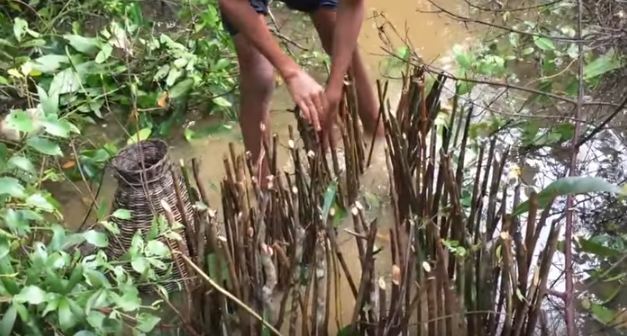 The video on the next page shows you how this kid caught fish using a primitive trap he built in the middle of the jungle.